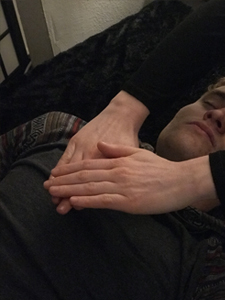 Tapping, also known as EFT (Emotional Freedom Techniques) is a powerful healing technique that has been proven to effectively resolve a range of issues, including stress, anxiety, phobias, emotional disorders, chronic pain, addiction, diseases and so on. Tapping is based on the combined principles of ancient Chinese acupressure and modern psychology. Tapping with the fingertips on specific acupuncture/acupressure points on the body, while focusing on negative emotions will help to release those negative emotions, calm the nervous system, rewire the brain to respond in healthier ways, and restore the body’s balance of energy. Tapping helped me to heal myself emotionally and physically. I was able to heal my eczema, that I had for many years that no medications would help with. I've also helped myself release fears and anxieties that had been with me since childhood. In this class I will be teaching you a simple Tapping sequence, providing a list of emotions you may be feeling or have trapped, my technique used to pinpoint what emotions the body wants to release, and sharing with you more on how Tapping changed my life for the better! Do you have food sensitivities? Tired of eating "healthy" and still feeling sick, have headaches or lack energy? Having trouble with your weight but nothing seems to be working? Or do you just want to be healthier? In this class, I will show you how to muscle test yourself and others to find out what foods your body does and does not like. I now have more energy, I don't get that mid-day crash, I don't have chronic headaches anymore, and I sleep better. Muscle testing, also known as applied kinesiology, gets you answers from the subconscious mind; The subconscious mind is like a human computer, recording everything that has happened in our lives. The body has within it and surrounding it an electrical network or grid, which is pure energy. Because energy runs through the muscles in our bodies, if anything impacts your electrical system that does not maintain or enhance your body’s balance, your muscles will temporarily virtually “short circuit” or weaken.